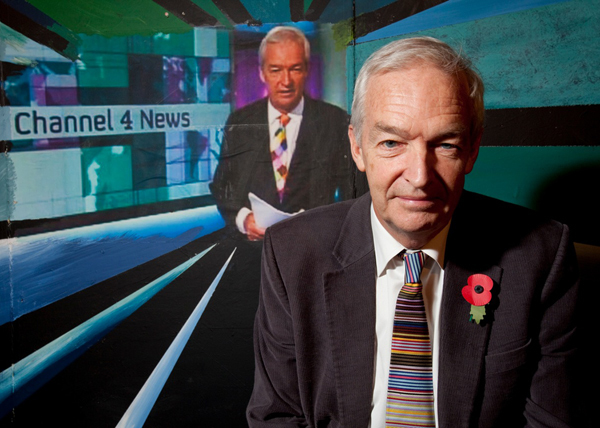 Veteran news anchor Jon Snow has presented Channel Four News for over twenty years and has interviewed many powerful politicians and world figures. When he first started his career he would spend hours crafting elegant questions and making detailed notes before interviewing, say, the Chancellor of the Exchequer, hoping to make a knock-out blow. But he realised he was so keen to ask his telling questions that he was failing to listen properly to the interviewee, and that listening, as well as asking, is the true sign of a good journalist. Nowadays he doesn't bother with long pre-written questions - but often just scribbles down a single word, taking care to listen very intently to every reply. Jon revealed at his talk on November 11th that perhaps his favourite interviewee of all time was Nelson Mandela. He had just been released from prison and therefore had none of the media training political leaders were routinely given to handle journalists' probing questions. He recalled that Mandela listened to every question, looked him straight in the eye whilst replying, and was totally honest in his response. It proved an exhilarating change from the usual attitude of politicians determined to score points and promote their policy, irrespective of the question asked. Watching television news reports of atrocities and natural disasters, it can be tempting to think that the journalists covering the stories are hard-nosed and immune to any emotional reaction. But Jon insists it's possible to report on momentous events, often showing people at their most bestial, without switching off from the suffering. Jon admitted that he is often deeply moved when confronted with shocked victims of wars and natural disasters, such as the woman who approached him among the mountain of rubble and detritus following the Japanese tsunami and asked him if he had seen her husband. There were piles of boats, vehicles, bodies and even houses and the hope was clearly minimal – and he later had to just turn away and cry. However, he added that – despite sometimes having to throw out clothes impregnated with the smell of death after visiting war zones – he never has nightmares and usually sleeps soundly. And of course like any veteran reporter, Jon has a wealth of stories to tell. He recalled travelling in a small jet with the Ugandan dictator, Adi Amin, who had seemingly fallen asleep with his gun in its holster. Several thoughts crossed his mind – should he shoot Amin, was the gun loaded, what would happen if the bullet pierced the fuselage? In the end, he resisted, and the mass-murderer went on to live untroubled in Saudi Arabia until just a few years ago. Jon believes that he's not the only one with great stories - he find people fascinating whether they are famous or otherwise. He delights in hearing the views of people from all walks of life and helps out at a homeless charity for precisely that reason. On train journeys, he often strikes up conversations with people who give him a new insight, such as a deaf couple in their sixties who had been handicapped since childhood after contracting meningitis. As a self-confessed late-developer, having been thrown out of Liverpool University, he is continually fascinated by the work of those academics he meets during journeys and who explain their field and introduce him to entirely new areas. Jon also believes that stereotypes overseas are often far from reality. In Iran, one of his favourite countries, he finds a tremendous sense of decency among the people and quite alien from the abrasive leaders who seem intent on developing the nuclear-bomb as a riposte to the perceived threat from Pakistan, rather than Israel or the United States. Jon recalled the British Museum lending the Iranians an ancient stone cylinder from Persia, featuring one of the earliest statements of human rights. Two million visitors came to see it and it was returned on time and unharmed when the museum asked for its safe return. A record 130 people attended Jon's talk and the total profit was £846, with everybody marvelling at his effortless fluency and wit.